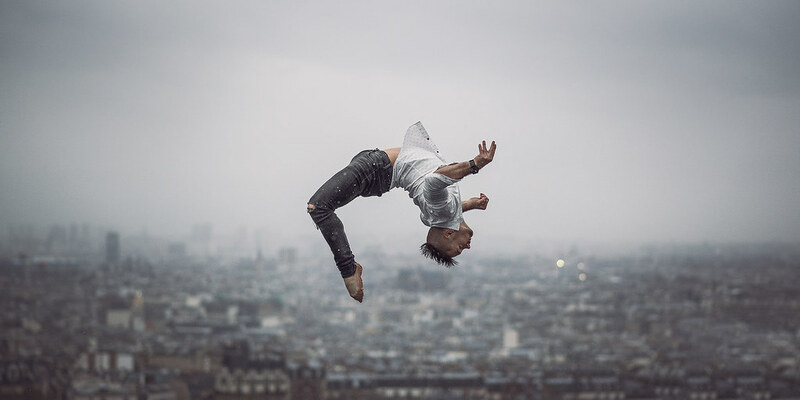 French photographer Dimitry Roulland captures the beauty and strength of the human body in a manner so captivating and graceful that it's difficult to look away. His models —mostly dancers, acrobats, and gymnasts— twist and turn in near-impossible poses, blending in with the landscape. His interest in body-arts photography started a few years ago when he met his namesake, a model named Dimitri. “It was the very first session I did with a gymnast and I really liked it! That was the beginning of a beautiful story,” he said. When he’s not shooting in scenic cities like Paris, Montpellier, Bordeaux, or Toulouse, he’s at home doing the post-processing work. We were drawn to Dimitry’s work because of the beautiful French landscapes he chooses as backdrops for his carefully-composed images and for his ability to perfectly capture the harmony of a body’s movements. To create these dreamy photographs, Dimitry likes to work in semi-manual mode, using a large aperture to blur the background. “I work only with fixed focal lengths: the 24mm 1.4, the 50mm 1.4 and the 85mm 1.8.,” he explained. Follow Dimitry’s Flickr photostream to discover more beautiful images of ballerinas, yogis, and circus artists and to find out about his next photographic project coming up in 2018. Stay tuned! February 28th is National Floral Design Day — a day that is all about appreciating floral design as a unique and creative art form.